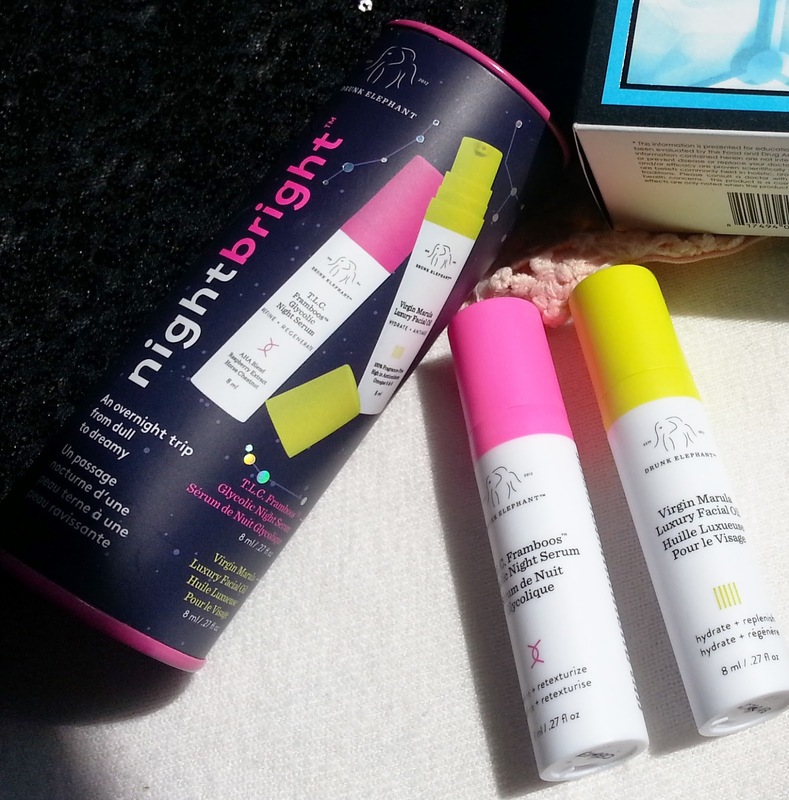 If you saw my Sephora VIB sale goodies, then you would have seen that I picked up both the Rise + Glow set, and Night Bright set from Drunk Elephant. Both of these sets are skincare duos that work with one another. One for daytime use, and the other for nighttime use. 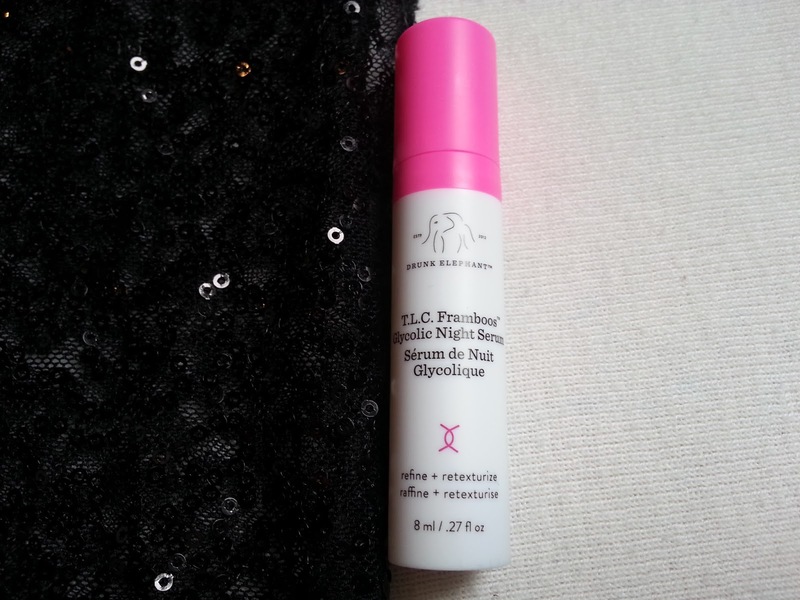 If you are a beauty or skincare enthusiast, and have an Instagram account, then I'm sure you have heard of, or have seen Drunk Elephant products. These are all sample sizes at 8mL each. 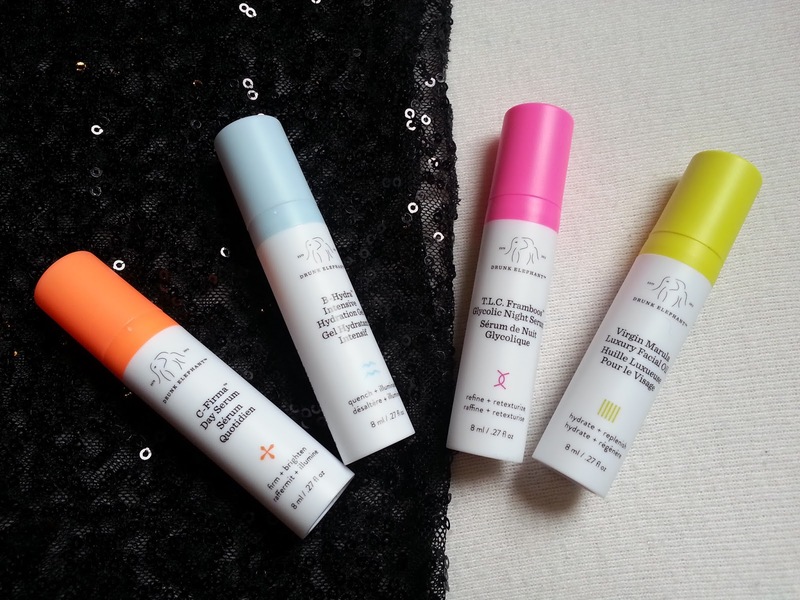 I will have swatches at the end of this post so you can see the consistency, and colour, of these skincare products. The rise + glow™ travel-sized duo is your skin's daily dose of vitamins B and C for an all-day quenched and glowing complexion. The formulas, which include the C-Firma™ Day Serum and the B-Hydra™ Intensive Hydration Gel, deliver powerful antioxidants to visibly firm and brighten the skin as they replenish essential hydration. A super potent vitamin C day serum packed with a powerful antioxidant complex, essential nutrients, fruit enzymes, and an antiaging chronopeptide to visibly firm, brighten, and diminish the appearance of photo aging. 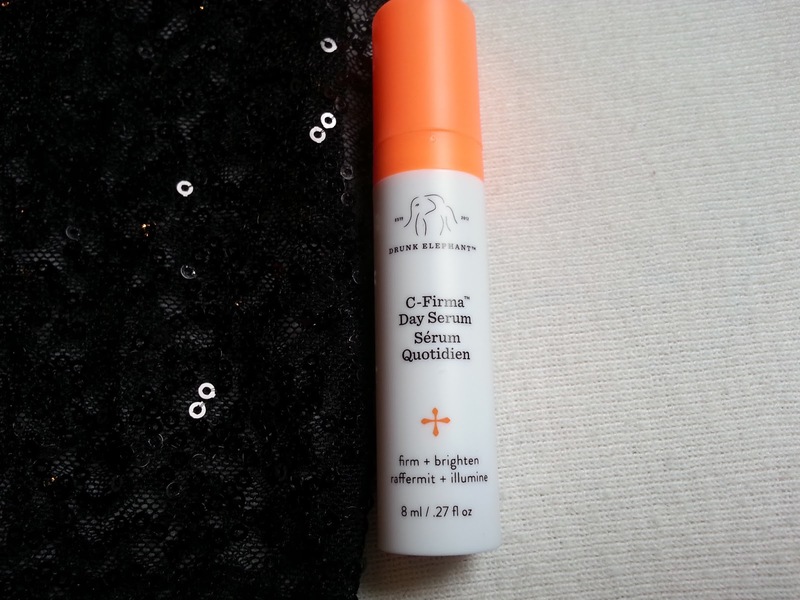 In the morning after cleansing your face, you apply this C-Firma Day Serum. 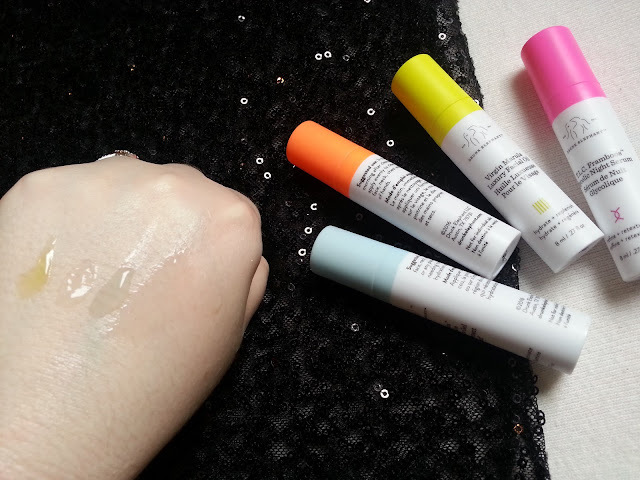 It makes many claims, and over the past few weeks, I can't say that I have seen any difference in my skin in regards to firming or brightening. Make sure you wear a sunscreen when using this product. It comes out orange, and has a strong scent that seems to linger all day long. Full size is 1oz/30mL and sells for $100. 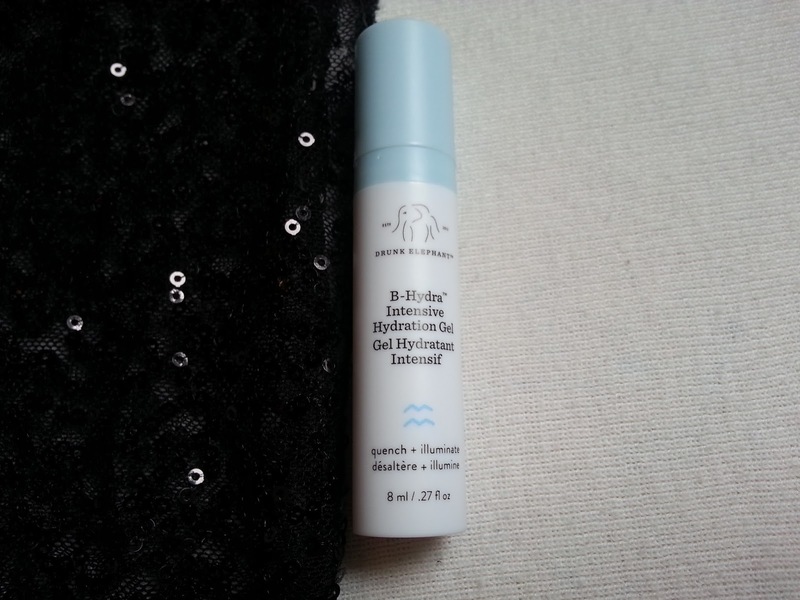 An ultra-hydrating, refreshing vitamin B5 gel that replenishes nutrients, visibly brightens, and improves the appearance of skin texture and tone, while delivering intense hydration throughout the day. This is definitely a gel product. It soaks right into the skin, and I found that I could use it under makeup without it pilling, which is great since I seem to have an issue with that and creams with makeup. Anyway, I wouldn't say that it is intense hydration, but it does provide some hydration to the skin. It isn't sticky and doesn't take long to soak into the skin. The full size is 1.69oz and sells for $65. While I appreciate being able to try these as sample sizes, I can't see myself ever repurchasing the Vitamin C as a full size item. I didn't notice a big enough difference in my skin while using it, and I really hated the scent that lingered on not only my face all day, but also my hands. It didn't matter how many time I washed them, the scent was there. I did enjoy the B Hydra Gel, but I feel you could get the same type of gel moisturizer (Clinique Moisture Surge comes to mind) for a much lower price, and larger size. Drunk Elephant’s nightbright™ duo works while you sleep to even your skin’s texture and tone, diminish the look of fine lines and wrinkles, minimize the appearance of pore size, and deliver intense hydration for a restored, youthful glow when you wake. The T.L.C. Framboos™ Glycolic Night Serum refines and resurfaces skin by gently dissolving dead skin cells and supporting the skin’s natural collagen production. The Virgin Marula Luxury Facial Oil is an antioxidant-rich skin treatment that hydrates, preserves, and calms with no greasy residue. Both products work together to visibly restore a healthy, youthful glow. This high-tech gel resurfaces dull, congested skin, gently lifting dead skin cells away by gently dissolving the glue that holds them to the surface. The results are greater clarity and a smoother, more even-toned complexion. Formulated with AHA/BHA blend, T.L.C. Framboos™ sinks in easily and delivers effective chemical exfoliation without the harsh side effects like dryness or sensitization. Fine lines, wrinkles, discoloration and other signs of aging will be greatly diminished, along with excess oiliness and the appearance of pores. It’ll let you go from a dull complexion to a radiant one. I've been interested in trying different AHA's because I find that while my skin doesn't look dry when I'm not wearing makeup, it looks super dry when I wear foundation or powder products, and it looks awful. This is where the AHA comes into play instead of using a physical exfoliant which can sometimes be more damaging to the skin. Anyway, I've been using a Neostrata AHA and I don't find that I'm getting the results I would like - which is why I really wanted to try the Drunk Elephant AHA. Also, the hype has something to do with it as well. So after you wash your face, and tone, you then use this AHA. It does slightly tingle, but that quickly goes away. You let it sink into your skin for about 30 minutes, and then you can go in with your other serums, or whatever else you use in your routine. I have to say that I was surprised by this one. Like I mentioned above, my bare face doesn't look dry, but as soon as I apply foundation, it's a disaster. Well, after about 2 weeks of using this every night, I SAW a difference. My skin didn't look as dry or patchy when wearing makeup, and it didn't soak into my skin to make it look uneven. I was really happy with this one. My skin feels less dehydrated as well. Full size is 1oz and sells for $112. Virgin Marula Luxury Facial Oil delivers benefits against the signs of aging and incredible antioxidant defense against environmental stressors and free radicals. 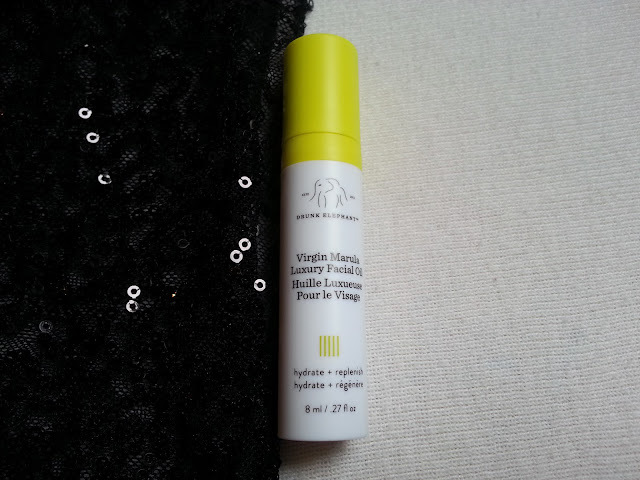 Highly absorbent, Virgin Marula Oil creates a noticeable reduction in the appearance of fine lines, wrinkles, redness, and blotchiness, and a marked improvement in skin's elastic feel. Appropriate for all skin types, including the most sensitive, this oil is anti-microbial and nutrient rich, and leaves no residue behind. I wasn't expecting much when I ordered this. I figured it would be just like any other facial oil. And it pretty much is. I don't find it extra hydrating, and the consistency is just the same as any other facial oil. I add it in with my moisturizer at night time. I will say when I wake up in the morning, everything has soaked into my skin, unlike some other oils that kind of sit on your face and leave you greasy in the morning. While I liked the aspect about that, I wouldn't pay $90 for 1oz. I'm sure Marula Oil can be found from other companies. I also have a few other sample sizes of various brands that I still need to try, and maybe I will find something similar in one of those. As promised, swatches. From left to right... C-Firma Day Serum, B-Hydra Intensive Hydration Gel, T.L.C. Framboos Glycolic Night Serum and then Virgin Marula Luxury Facial Oil. You can see that the C-Firma is orange, and it has the strongest scent out of all four. The other three products are clear. Nothing special about the appearance of those! So out of all four products, the only one I would really consider repurchasing is the T.L.C Framboos Glycolic Night Serum. 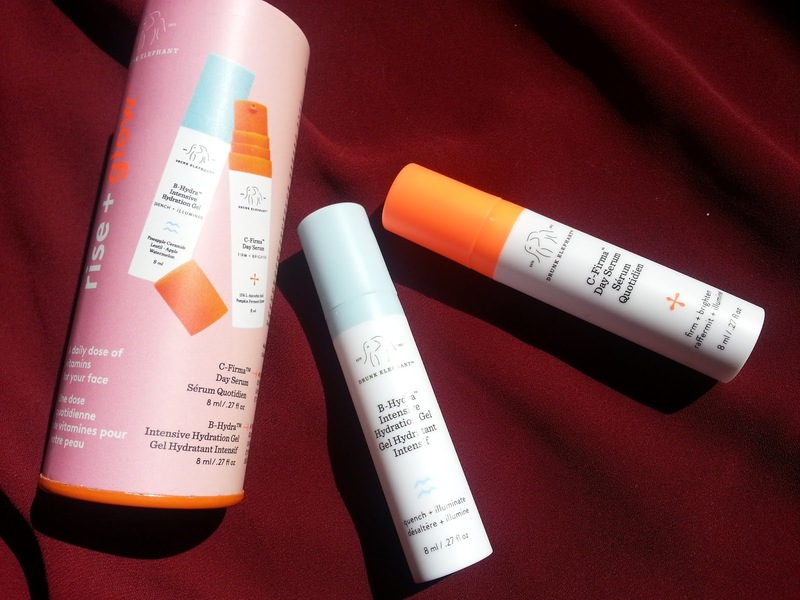 I will be putting some Sunday Riley products to the test once I finish these samples, so I will make a decision based on which I like better when I get to those. But if I were to repurchase the Glycolic Serum, I would wait for another Sephora sale so I could save a little bit on it, since $112 is quite pricey! Love your review! I've been so curious about these products so I find this very helpful.